Left: Pastor Rod Bittick outside the Pixley UB church. Right: the sanctuary. 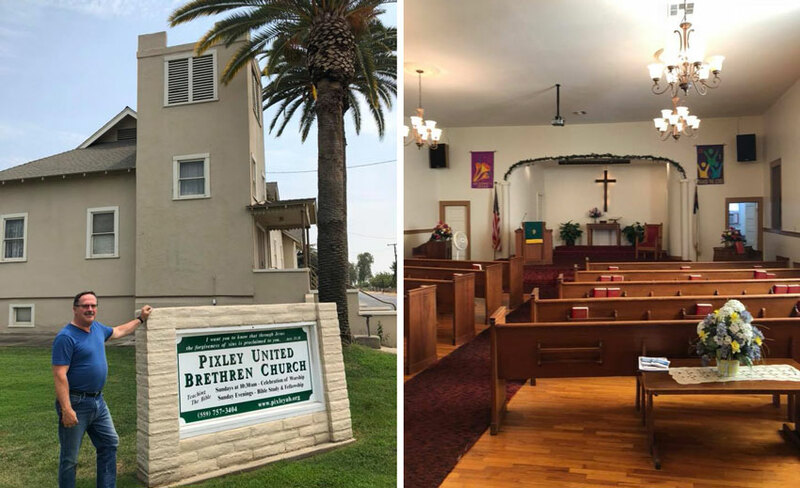 On Monday, July 30, Bishop Todd Fetters visited the Pixley United Brethren church in Pixley, Calif. This church, founded in 1883, is now the only United Brethren church in California. Rod and Melody Bittick have served the Pixley congregation since 1985, and are among the longest-tenured UB pastoral couples at the same church. Both came out of the former Hillsdale UB church in Sacramento, when former bishop Ron Ramsey was the pastor. Rod graduated from Huntington University in 1976, and from its Graduate School of Christian Ministries in 1977. Of note: George Weaver, who was bishop 1969-1977, grew up in the Pixley area and became a Christian at the Pixley UB church in 1943.